TORONTO — Ontario is envisioning a future in which millions of electric vehicles are on the roads, but analysts predict consumer uptake will remain far off the government target of five per cent of vehicles being electric by 2020, despite tens of millions of dollars in subsidies. The Liberal government has been encouraging electric vehicle sales by doling out $75 million in rebates to vehicle owners, offering various other incentives and programs, installing a network of charging stations and spending $1 million to open an electric vehicle education centre. But that so far hasn't translated into vast numbers of vehicles. The official data for 2017 isn't yet available, but at the end of last year, electric vehicles represented less than one per cent of all passenger vehicle sales in Ontario. In just two years, by 2020, the government hopes to see that number increase to five per cent. It can't be done, analysts say. "The chances of meeting it aren't low, they're zero," said auto industry analyst Dennis DesRosiers. "In the auto sector all roads lead to electric, it just happens to be that the road to serious acceptance of them is probably at least 2030 and more likely 2040, 2050." Tony Faria, an auto industry analyst at the University of Windsor, agrees that Ontario won't meet its goal by 2020. "We will almost assuredly get to five per cent electric vehicles purchased or on the road at some point in time, it's just not going to be in the next couple of years," he said. "We're really wedded to our gasoline-driven vehicles because of the flexibility they give us distance wise, amazing availability of where you can fill up and so on." Range anxiety — a fear that an electric vehicle would run out of charge somewhere far from a charging station — is cited by analysts, the industry and government as one of the main reasons more people haven't yet switched to electric vehicles. The government announced in July 2016 that it would spend $20 million to build a network of 500 public charging stations along highways and at public places across the province by March 31, 2017. But now, more than eight months after that self-imposed deadline, just two-thirds of the stations are in use. Transportation Minister Steven Del Duca said that timeline was "ambitious" and there have been challenges around the locations of some of the chargers, permits and construction delays, but he still believes the five per cent target can be met. "We see what the numbers are currently, but again when you look at not only the demand we've seen over the last few months, but the forecasted demand for the next three or four years we do see and certainly do predict fairly sharp increases in people's appetite for [electric] vehicles," he said. It takes time to get people to change their behaviours, Del Duca said. "People get very comfortable in their patterns, both as commuters and when they're making their product selections when they're looking at cars," he said. "I think there was always going to be the need for some time for a cultural shift." FleetCarma, a company that promotes electric vehicles, also reports on quarterly sales numbers and found that in Ontario those numbers are up 96 per cent year-over-year for the first nine months of 2017. In the second quarter, they reported electric vehicle sales represented about 0.7 per cent of the market. "While these numbers may seem small compared to the total number of auto sales the thing to take note of here is the trajectory of the numbers," they wrote. The president of the Canadian Vehicle Manufacturers' Association said those numbers bode well and he believes there is a good chance of hitting the five per cent target in 2020. The industry itself is doing a lot to encourage sales, but for now the market demand is still very small and manufacturers are losing money on their production, said Mark Nantais. "There's a good deal of literature out there by independent parties to suggest that at this point in time vehicle manufacturers are losing anywhere from $10,000 to $14,000 per vehicle," he said. That will change over time as demand increases, he said. "Sometimes we proceed with costly technologies that — while we might be losing money on them — we ultimately think that the market will improve, that the number of vehicles will increase, that the cost of the technology will come down," Nantais said. 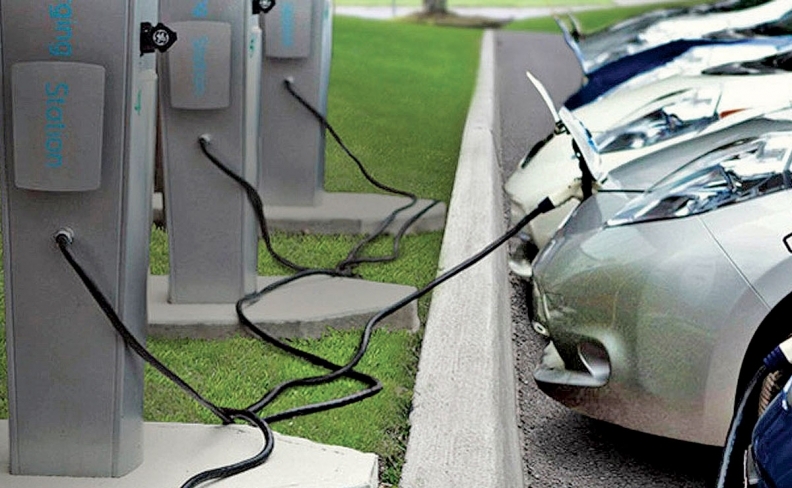 To increase sales, the government offers rebates of up to $14,000 for electric vehicles that cost up to $150,000. In order to encourage customers to choose electric vehicles, auto dealers will often give buyers the rebate out of their own funds, but that has left some out hundreds of thousands of dollars, they say. Frank Notte, with the Trillium Automobile Dealers Association, said many dealers are waiting up to five or six months for the government to reimburse them. One dealer is owed more than $400,000, he said, and GM dealers in the Greater Toronto Area alone are owed about $2.3 million. The Ministry of Transportation wouldn't confirm those numbers, but said it is working to streamline the process so dealers can get reimbursed more quickly. The province has also put $1 million toward the Plug'n Drive Electric Vehicle Discovery Centre in northern Toronto, where people can learn about and test drive electric vehicles.The centre said it has seen 1,600 test drives with more than 4,000 visitors since it opened this spring.